B&W Management offers luxury beachfront vacation condo rentals on Clearwater Beach with several units in The Villas of Clearwater Beach and Surfside Condominiums. Well-appointed, luxury 2 bedroom, 2 bath condominium. Light, fresh and airy featuring bright splashes of color. Spectacular straight on view of the white sands of Clearwater Beach and blue-green waters of the Gulf of Mexico from the balcony. Comfortable 2 bedroom, 2 bath condo unit with newly remodeled kitchen and living room areas. Balcony off of master bedroom and living room overlooks the sugar sands of Clearwater Beach and the Gulf of Mexico. Welcome to your 2 bedroom/2 bath beach condo! Get ready to relax in comfort and style. Gorgeous kitchen in blue and beautiful tile work in both of the bathrooms and in the kitchen. Floors newly tiled throughout entire unit. Spectacular, completely unobstructed view of Clearwater Beach and the Gulf of Mexico from your unit. Gorgeous 2 bedroom/2 bath unit with fresh decor reminiscent of the upper NE coastline without the cold weather! Remodeled bathrooms, newly tiled floors throughout unit, with bold navy and red accents in a nautical theme. Ahoy mates, you have arrived in paradise! Spacious 3 bedroom, 2 bath unit with a nice balance of modern and traditional style. Gorgeous kitchen with rich wood cabinetry, granite counters/back splash, and contemporary dining area. This unit features Jacuzzi tub in the master bedroom suite. Fun, casually elegant 3 bedroom, 2 bath Premium condo unit that will feel like you've come home to the beach. 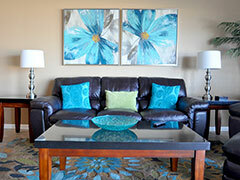 Relaxing neutral backgrounds and cheery bright color accents all through the condo. Understated luxury, Premium 3 bedroom, 2 bath condominium unit featuring our largest kitchen. Recently completed a total remodel that included the kitchen expansion. This unit features a beverage refrigerator under the bar counter and a 60" flat screen TV in the living room. Beautiful 3 bedroom, 2 bathroom corner unit. The unobstructed beach view stretches around the North corner of the building, and the expansive Gulf of Mexico view will invite you to the sugary sands. 401 expresses the comfortable, light and airy true Florida style without overlooking the luxury you're seeking. 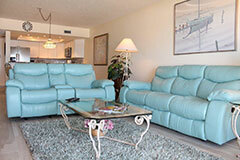 Luxurious 3 bedroom/2 bath condo unit, sleeps eight. 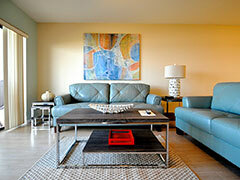 Rich leather and warm wood furnishings with bright, tasteful colors throughout unit. Views of the beach from every room with windows along entire south side of unit. Features a 60" flat screen TV in living room with HD channel lineup. Come home to the beach every night! This 3 bedroom/2 bathroom unit is very tastefully decorated with natural wood furnishings and earthy colors. Experience the comforts of home with everything you need for your beach vacation. Features a different sunset every night on the Gulf of Mexico from the privacy of your balcony. Beautiful 3 bedroom/2 bath traditional styled interior with fantastic views of Clearwater Beach and the Gulf of Mexico right outside your windows! Enjoy your morning coffee or a different sunset each day from your balcony off of the master bedroom suite and the living room. Our 4 bedroom, 3 1/2 bath Penthouse unit is a newly furnished luxury condominium with spectacular views of beautiful Clearwater Beach and the sparkling Gulf of Mexico. Two bedroom/two bath condo, sleeps six. Enjoy this recently remodeled unit that has warm natural wood and brick decor with varying shades of the blues of the Gulf waters. Sit on your private balcony to feel the ocean breezes and relax! 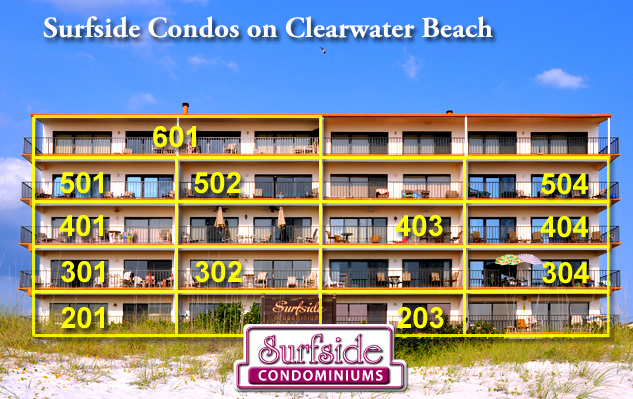 The building is within walking distance to all the shops, restaurants and entertainment on the beach. 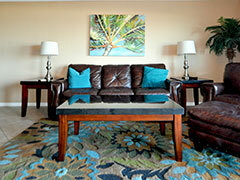 Open and spacious 2 bedroom/2 bath unit ready to accommodate your tropical get away or stay-cation! Enjoy the comforts of home right on the beach. Unlimited sunshine and front row seats to a different sunset each evening from your balcony overlooking the Gulf of Mexico. Recently updated 2 bedroom/2 bath condominium unit. Freshly painted throughout space with new furnishings and decor creating a relaxing environment. Overlooking the beach along the Gulf of Mexico. Can you hear the sound of the waves coming in? Beautifully remodeled 2 bedroom/2 bath condo featuring an additional sleeping loft that children request year after year! Unique and personal decor touches that make you feel as if you have arrived at your own beach house. Gorgeous and inspired finishes on the furnishings in muted seaside colors, fresh as a walk on the beach right inside your unit. A beautiful 3 bedroom, 2 bath, corner unit with views of Clearwater Beach and the Gulf of Mexico from the front of the unit, and the Villas pool from the back of the unit. Check out one of our latest completely remodeled & newly furnished 3 bedroom/2 bath unit in the Villas building. Fresh, airy colors of the sugar sands and the ocean wave blues. Relaxing is a breeze in this beautiful condo outfitted with everything you need for staying on the beach. Unique 3 bedroom/2 bath unit with views at each end of the condo and four private balconies. One overlooks Clearwater Beach, a secluded one off of the master bedroom, and one off each of the guest rooms overlooking the pool. Fun and bright decor, great for families! Birds eye view from this 3 bedroom/2 bath condominium. Feel like you are on top of the beach in this beautiful, bright unit decorated tastefully with plenty of light from the windows wrapping around the entire south side of all the rooms. Vaulted ceilings in the living room make the space feel endless. 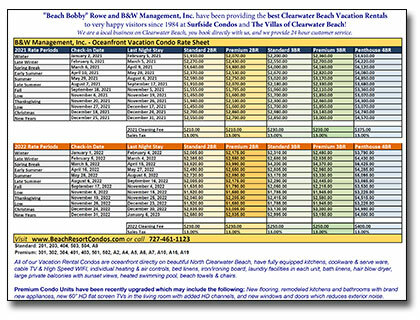 NOTE: Our rates are based on what it costs to provide the highest quality vacation rentals we can possible offer. We hire only the most qualified customer service staff, maintenance workers, and experienced housekeepers. We do not "cut corners" or otherwise compromise our standards in order to price compete with VRBO/HomeAway/AirBnB, etc. Our guests appreciate the time and care we put into our units and their comfort. We are an "old fashioned" Vacation Rental Management company where personal contact and our customer's needs come first in a time when the vacation rental industry is being turned into a greedy cold "no customer service" machine. Everything was great we loved the unit . Definitely be coming back in the future for our Clearwater beach vacations. Again loved the condo everything thing was great . Thanks we will see you again in the future. The unit was awesome, well decorated and very comfortable. Cleaned well prior to arrival. It's been 20 years since we lived here and Clearwater Beach and all it offers was great. Loved the daily rain, pushed all the wimps off the beach and it was like having the entire beach to ourselves!! We choose to return for a stay at the Villas for several reasons. One of the most important reasons is to be able to watch the sunset from the balcony every evening. The kids liked the extra loft and made good use of it. I appreciated the availability of the slow cooker and the variety of kitchen utensils/bowls/pans etc. that were available. The kitchen was very organized and the dishes/pots/pans etc were all clean and neatly arranged. The inside of the oven was very clean. We had a wonderful vacation. We love staying at the Villas. Anna was very helpful. Great views and tastefully decorated/furnished. Condo was in walk in condition. Love the access to the beach and within walking distance to the business area. Beach was very clean and enjoyable. Weather was great during our vacation week. B&W management is quick to answer your call and provide service. Highly recommended. Very tastefully decorated, clean, and welcoming. 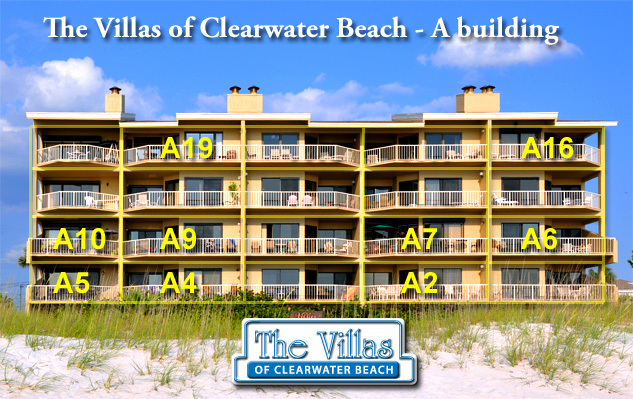 Right on the beach, steps to pool, nice walk to restaurants and shops. Just want to say thank you for being so accommodating and thinking of all the details that make travel easier. Having hand soap, dish soap, detergent, and starter toilet paper and tissues is greatly appreciated. thank you. Also, we were so happy to have the playpen and high chair. Awesome, will be staying here again without a doubt! Extremely happy with cleanliness, was a bit surprised in a good way. Definitely a plus!! Perfect location...couple footsteps from beach, reserved parking was hassle free, lots of things in unit to save us hassle (pots pans etc), awesome balcony, maintenance guy was very nice, can go on and on. Very nice! Everything we needed was here. Great location on ocean close to restaurants. Nice remodeled kitchen. Comfortable beds and overall nice furniture. Love the remodeled floors. All flat screen HD TVs are great. Amazing location...love the beach, shops and restaurants. Love the beach area. The only thing that was difficult at times was traffic. Minor thunderstorms/rain each day but overall, great weather. Had a great time and loved the unit. Thank you!!! We love the location and the Villas. The codes are nice and easy access. Love the parking and that it is shaded. I love the gulf coast and Clearwater beach. A lot of things to do. Will Rent from You for Now on! Absolutely wonderful condo and everything very comfortable. Can't wait to return. Just excellent says it all ~ We love the north end of the beach and the Villa's is perfect. We rented a unit 2 years ago from another source and needless to say we will always from now on rent from you guys. Been coming to Clearwater beach for 32 years originally staying in an older mom and pop motel called The Garden Apartments. We were very sad when torn down but are very happy to have your Condo units to stay in. Plenty of room for us all! And a great location!! We only had one day that was cloudy & rainy so we opted for the aquarium! We were thrilled with our stay. Awesome area with great access to beach restaurants and shopping. I thought the exterior storage box is a great idea. Love your webcam too.